After three years of political gridlock and missed deadlines, the Illinois General Assembly passed a budget for the coming fiscal year on the last day of its regular spring session. Governor Bruce Rauner promptly signed the budget amid bipartisan celebration. Although the $38.5 billion budget for fiscal year 2019 is roughly balanced on paper, concerns persist about whether the revenue and spending estimates are realistic. The budget assumes savings of $382 million from a new pension buyout plan that has not been vetted in public hearings. The State continues to book nearly $300 million from the sale of its main office building in Chicago—a sale that was first proposed by the Governor almost three years ago. 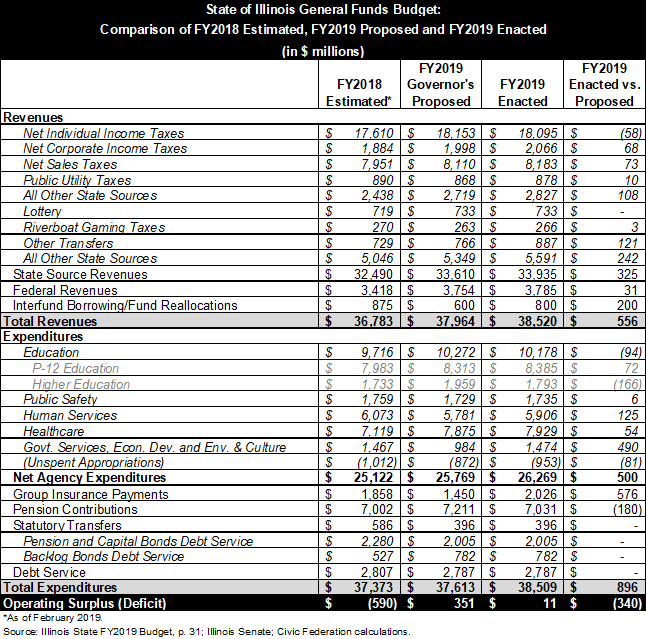 Even if such assumptions are borne out, the FY2019 budget does not address Illinois’ biggest fiscal challenges, including a backlog of unpaid bills that currently stands at $7.5 billion. It is unclear how the budget might affect the State’s $130 billion unfunded pension liability because actuarial reviews of the new pension plan have not been made available to the public. The lack of drama surrounding the budget for FY2019, which begins on July 1, 2018, was in sharp contrast to the past several years. Governor Rauner took office in January 2015, the same month that temporary income tax rate increases were automatically phased out. The Republican Governor made pro-business reforms a condition for approving higher taxes, but Democrats who control the General Assembly did not agree to those terms. As a result, full budgets for FY2016 and FY2017 were never enacted. Six days into FY2018 and over the Governor’s veto, the General Assembly enacted a budget for the current year that nearly returned income tax rates to their pre-2015 levels. Because of the tax increase that added about $4.5 billion to FY2018 revenues, developing the FY2019 budget involved fewer challenges than the previous years’ budgets. Still, the Governor’s FY2019 budget proposal in February faced criticism for several cost-cutting proposals, including a plan to shift pension costs to local school districts and a continued reduction in funding for local governments. Negotiations began in earnest in mid-April, when Governor Rauner asked General Assembly leaders to appoint representatives to participate in budget discussions with his staff. The resulting budget package consists of an appropriations bill and a budget implementation bill with statutory changes needed to put the budget into effect. The measures were passed overwhelmingly by the Senate on May 30 and the House on May 31 and signed by the Governor on June 4. The following table compares the enacted FY2019 General Funds budget with the Governor’s FY2019 budget proposal and shows the most recent available estimates for FY2018. Both revenue and spending figures for FY2018 will be revised by the end of the current fiscal year. On the revenue side, budget officials said combined individual and corporate income tax receipts for FY2018 are expected to be about $500 million above earlier projections due mainly to federal tax changes. In addition, $200 million of borrowing from other funds that was budgeted for FY2018 has been shifted to FY2019. Expenditures will increase in FY2018 because of $1.2 billion in supplemental appropriations, including $405 million for the Illinois Department of Corrections to cover 2017 bills for day-to-day prison operations. The supplemental appropriations also include $63 million for wages owed to union workers since 2011. The American Federation of State, County and Municipal Employees (AFSCME) had temporarily agreed to defer previously negotiated wage increases because of the State’s fiscal problems, but the raises were never paid. After the Illinois Supreme Court ruled that paying the back wages required a legislative appropriation, the General Assembly in 2016 passed a bill to pay the wages but Governor Rauner vetoed it. Even though these revisions would increase the FY2018 operating deficit by about $900 million, officials have said that the additional appropriations were generally accounted for in the backlog of unpaid bills. Absent other changes, the additional revenue would decrease the previously projected backlog by about $300 million. The FY2019 enacted budget projects $38.5 billion in revenues. While the budget contains no new revenue sources or increases in existing rates, it does rely on the FY2018 income tax increase from 3.75% to 4.95% for individuals and from 5.25% to 7.0% for corporations. Rates temporarily rose to 5.0% from 3.0% for individuals and 7.0% from 4.8% for corporations in 2011 before partially rolling back in January 2015. The estimated FY2019 revenue amount is $556 million higher than the estimate contained in the Governor’s budget proposal. Of this amount, $200 million reflects the return of excess amounts in the Income Tax Refund Fund to the General Funds. Another $200 million represents additional interfund borrowing authority. The FY2018 budget authorized $1.2 billion of interfund borrowing. In February the Governor’s office estimated that only $600 million of it would be used in that fiscal year and included the remaining $600 million in its projection of FY2019 revenues. The General Assembly now predicts that only $400 million will be used by the end of FY2018, and has thus shifted $200 million in revenues to FY2019. The enacted budget does not include the Governor’s proposal to forgive the debt to the other State funds. However, it is still unclear whether the State’s other funds can sustain this level of borrowing on an ongoing basis or whether this measure is best characterized as a one-time revenue source. The enacted budget reduces the holdback of income taxes from the Local Government Distributive Fund and sales taxes from public transit funds to 5% from its FY2018 level of 10%. This will result in an estimated $98 million for local governments and reduce State revenues accordingly. Additionally, the collection fee for locally imposed sales taxes is reduced from 2% to 1.5%. Since this fee goes into a special fund for administering collections, the reduction does not affect the General Funds budget. The enacted FY2019 budget, like the Governor’s proposed budget, the proposed and enacted FY2018 budgets and the proposed FY2017 budget, relies on $300 million in proceeds from the sale of the James R. Thompson Center in Chicago. As in the FY2018 budget, the State is assuming $60 million in expenses relating to the building’s sale and relocation of State employees. However, the enacted budget assumes that only $30 million of this expenses will occur during FY2019, for a net budgetary impact of $270 million. Legislation authorizing the sale was passed by the General Assembly in May 2017, but has not yet been delivered to the Governor for signature. Even if the bill is enacted, it is unclear whether the sale will occur during FY2019 at the expected price. The enacted FY2019 budget includes General Funds spending of $38.5 billion, an increase of $896 million, or 2.4%, from $37.6 billion in the Governor’s proposed FY2019 budget. Automatic annual increase (COLA) buyout: Tier 1 members, who receive the most generous pensions, will have an opportunity to get an upfront cash payment into a private retirement account in exchange for agreeing to a lower automatic annual increase in their benefits. Upon retirement, these employees will give up the 3% annual compounded benefit increases now paid to Tier 1 retirees and instead receive yearly increases of 1.5% of their base pension amount. In exchange, they will get a lump sum payment equal to 70% of the difference between the value of their benefits with the higher and lower annual increases. Assuming 25% of those eligible choose to take the buyout, savings to the State are estimated at $382 million in FY2019. Inactive member buyout: Inactive Tier 1 and Tier 2 members, who are no longer employed at their State pension-eligible jobs but are qualified for State pensions, will be able to receive 60% of the current value of their benefits as a lump sum payment into a private retirement account. State savings in FY2019 are assumed to be $41 million if 22% of those eligible participate. Lower cap on pension spiking: Additional pension costs due to salary increases above 3%—rather than 6%—would be paid for by local school districts, universities and community colleges. The State is expected to save $22 million in FY2019 due to the cost shift. The pension buyouts will be financed by selling up to $1 billion in bonds through FY2021, when the buyout offers end. The estimated State savings are net of debt service costs; officials expect savings on the difference between the assumed rate of return on pension investments of 6.75% to 7% and the interest rate paid on the bonds. The budget legislation directs the pension funds to implement the buyout plans “as soon as practical,” so it is not clear when they will take effect. The Teachers’ Retirement System, which covers teachers outside Chicago, says on its website that the implementation will take time and does not provide a starting date. Questions have been raised about the significant savings projected from the COLA buyout, and in particular about assumptions concerning the number of employees who will choose to participate. Legislation with different COLA buyout provisions received a hearing in a House committee in February 2018 but never came up for a vote. General Funds appropriations for preschool to secondary education increase by $72 million to $8.4 billion in the FY2019 enacted budget from $8.3 billion in the Governor’s budget. The enacted budget provides about $352 million for the new education funding formula, just above the $350 million annual target increase in the legislation enacted in August 2017 and proposed by the Governor for FY2019. The enacted budget includes a $50 million increase from FY2018 for early childhood education, compared with an increase of $10.5 million in the Governor’s budget. Higher education receives $1.79 billion in General Funds appropriations in the FY2019 enacted budget, compared with $1.96 billion in the Governor’s proposal. However, $206 million in the Governor’s budget was additional funding to offset the proposed shift of pension and health insurance costs to universities and community colleges. Without that additional funding, the enacted budget represents a $40 million increase from the Governor’s proposal, including a 2% increase over FY2018 for universities and community colleges and $25 million for a new merit-based scholarship program for universities. General Funds appropriations for Human Services are $5.9 billion in the enacted FY2019 budget, an increase of $125 million from the Governor’s proposed $5.8 billion. The increase reflects the restoration of funding to a number of programs that the Governor had proposed to reduce or eliminate, including child care services, addiction prevention and treatment services and the youth employment program. For Healthcare, the FY2019 enacted budget does not include savings of $175 million from reducing reimbursement rates for many Medicaid healthcare providers and eliminating program and rate changes enacted in FY2018. These changes would have required legislative and in some cases federal approval. The FY2018 amount in the table does not include $494 million in proposed supplemental appropriations for Medicaid. The Government Services area receives $1.5 billion in the FY2019 enacted budget, an increase of $490 million from $984 million in the Governor’s budget. The enacted budget restores $227 million in normal pension and retiree healthcare costs for the Chicago Teachers’ Pension Fund. Those costs were assumed by the State for the first time in FY2018 as part of the education funding overhaul, but the Governor had proposed to return responsibility for the costs to the Chicago Public Schools in FY2019. The enacted FY2019 budget also restores $129 million in State funding for health insurance for retired teachers and community college employees outside Chicago and reverses the Governor’s proposed spending reductions for constitutional offices, the General Assembly and the Illinois Supreme Court. The General Funds budget is roughly balanced with $38.52 billion in revenues and $38.51 billion in spending, resulting in a projected surplus of $11 million. This is less than the Governor’s budget proposal, which had projected a surplus of about $350 million. However, the enacted budget relies on fewer aggressive assumptions than the proposed budget did. The enacted budget fully funds State employee group health insurance, while the proposed budget relied on $470 million of prospective cost reductions. Nor does the enacted budget balance depend on shifting $619 million of net pension and health insurance expenses to schools, community colleges and universities, or reducing Medicaid reimbursements by $175 million, both of which had drawn significant opposition in the General Assembly. However, the enacted budget does retain the assumption that the Thompson Center will sell for $300 million (netting the State $270 million in FY2019). Furthermore, like the proposed budget, the enacted budget does not account for the likelihood that Illinois will have to pay step increases to State employees who have not received them since the expiration of their contract in 2015. This cost could be in excess of $300 million. Finally, the enacted budget introduces an aggressive assumption not included in the Governor’s proposal. The assumed $382 million in pension savings from the COLA buyout relies on a 25% participation rate by retiring employees and on successful implementation in FY2019. Even if the budget achieves its stated balance at the end of FY2019, Illinois will still not have reduced the remaining backlog of bills during the fiscal year. The backlog, which peaked at $16.7 billion, was reduced by more than half during FY2018, largely thanks to the issuance of $6 billion in bonds. The interest cost of that borrowing is $1.9 billion over 12 years, but that is less than the steep interest penalties paid by the State on overdue bills. However, the enacted budget does not anticipate any pay-down of bills in FY2019. Instead, the General Assembly passed a measure that could help alleviate the interest cost of outstanding bills. SB2858, if signed, would allow the State Treasurer to invest other State funds with the Comptroller, who would use the funds to pay of backlogged bills. The General Funds would pay a floating interest rate much lower than the 12% owed to vendors under the Prompt Payment Act or the 9% owed under the Timely Pay provisions of the Insurance Code. Proponents say the rates will likely exceed what the other State funds would have earned in more typical investments. Following the enactment of the budget, S&P scuttled any hope for an upgrade to the State’s bond ratings, calling the budget “an extension of the status quo,” and noting the failure to address the bill backlog or unfunded pension liabilities. Neither of the other two raters has commented on the enacted budget, although even before passage Moody’s issued a warning about the State’s future fiscal stability as pension and debt service together approach 30% of state-source revenue. Even so, the response from the ratings companies was muted compared to June 2017, when Illinois received downgrades to within one notch of junk by both S&P and Moody’s, and the companies warned of further downgrades if the State did not end its two-year budget impasse. By enacting full budgets for both FY2018 and FY2019 Illinois has avoided downgrades since then. Automatic annual increase buyouts are typically known as Cost of Living Adjustment (COLA) buyouts. The automatic annual increase in Illinois pension benefits for Tier 1 members is not related to the inflation rate, but the Civic Federation will use the COLA buyout terminology for ease of reference.